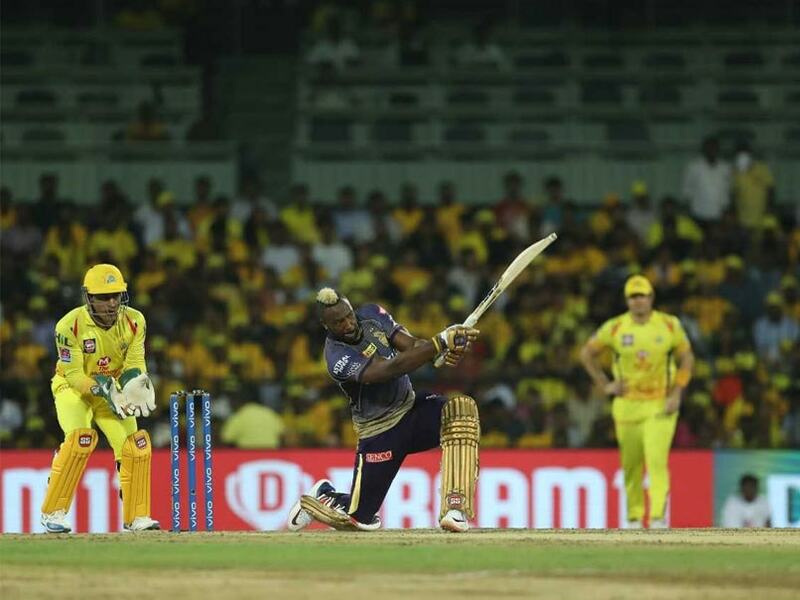 IPL 2019 Live Score Updates Between Chennai Super Kings vs Kolkata Knight Riders, straight from MA Chidambaram Stadium, Chennai. Harry Gurney is the last batsman at the crease. Jadeja strikes! Prasidh hits the ball straight to Harbhajan at short mid-wicket. KKR are 79/9 in 16.3 overs. Prasidh Krishna is the new batsman at the crease. KKR are 76/8 in 15.4 overs. Kuldeep has been dismissed off the first ball. Russell desperately wanted to take the strike. Kuldeep Yadav is the new batsman at the crease. KKR are 76/7 in 15.3 overs. Harbhajan strikes! He gets the wicket of Piyush Chawla. The left-hander dances down the track and misses the ball. Dhoni does the rest. Harbhajan Singh will be bowling the 16th over. MISSING the stumps. Russell is not out. Russell hits the ball straight down the ground to hit his 2nd boundary. Imran Tahir comes in to bowl his final over. Russell hits a boundary between deep square-leg and deep mid-wicket region. Ravindra Jadeja saves a certain SIX. He pulls the ball back on the right time to deny Russell his 2nd maximum. Scott Kuggeleijn will be bowling the 14th over. Chawla hits his 1st maximum in the deep mid-wicket region. Russell has been dropped. He top-edges the ball as Harbhajan running to his back, drops Russell on 8. This can prove costly later. Russell hits the 1st maximum of the innings in the deep mid-wicket region. With it, KKR cross the 50-run mark. Piyush Chawla is the new batsman at the crease. Tahir strikes again! Shubman Gill has been stumped. He fails to read the ball and departs for 9. KKR are 47/6 in 10.1 overs. KKR are 47/5 after 10 overs. Just three runs were scored in Jadeja’s over. Ravindra Jadeja will be bowling the 10th over. Andre Russell is the new batsman at the crease. KKR are 44/5 in 8.4 overs. Tahir strikes in his 1st over! Karthik hits the ball straight to Harbhajan at mid-wicket. Karthik departs for 19 off 21. Karthik sweeps the ball behind Dhoni to get his 3rd boundary. Imran Tahir has been introduced into the attack. KKR are 37/4. The pair of Karthik and Gill have added 13 runs for the 5th wicket. The CSK bowlers have kept the KKR batsmen in check as they have failed to fetch boundaries. KKR are 33/4. Captain Dinesh Karthik is batting on 12 while Shubman Gill is unbeaten on 2. He starts the over with 2 dot balls. Scott Kuggeleijn will be bowling the 7th over. KKR are 29/4 after 6 overs. Karthik gets his second boundary. He cuts the ball towards deep backward point region. Shubman Gill is the new batsman at the crease. Chahar gets his 3rd wicket! He gets the wicket of Robin Uthappa. Jadhav takes the catch at deep mid-wicket as Uthappa departs. KKR are 24/4 in 4.4 overs.